When Apple made the big decision to get rid of their original headphone jack, people panicked. The thought of having to give up your favorite pair of headphones or earphones is nightmarish, especially if they belong to a brand that you have used for years. The solution apple provided, another over-priced dongle, did little to calm the furious outcries of dedicated 3.5mm headphone users. “Just buy our dongle or go Bluetooth” Steve Cook forced upon legions of loyal Apple users. The reality is that you don’t have to. A range of different adapters have been developed that can be inserted directly into the Lightning Port of a range of Apple devices. The FiiO i1 DAC/ 3.5 to Lightning Headphone Adapter is a fantastic example of this, coming from a company that is known best for the range of portable and desktop headphone amplifiers that they produce. The first thing that you will notice about the FiiO i1 DAC/ 3.5 Lightning Headphone Adapter is actually the way that it looks. It features a seamless metal body with a matte black finish, making it look like an official iPhone attachment. It also has a built-in ability to detect whether you are using a pair of standard headphones or ones with built-in controls. We are big fans of easy-to-use, minimalist designs when it comes to amplifiers and DACs. Take the Nu-Force Icon for example, our favorite DAC/Amp combo for years, not just because of the sound quality but because it was affordable. We aren’t the only ones who are big fans of this kind of simplicity either. The new FiiO i1 picks up where the legendary Icon left off and we love it. If you don’t want to lug around a big bulky unit like the Oppo HA-2SE, then the FiiO might just be for you as the form factor isn’t that much larger than the boring dongle Apple tries to sell users anyways. It should be noted that this particular adapter is one of only a handful that has been fully certified for use with a variety of Apple devices. The certification itself is Apple MFi certification, meaning that the adapter will pose no risk to your iPhone, iPad, or iPod. Uncertified products come with a number of potential risks, including the risk of catching on fire, or giving the user an electric shock, so it is always important to look for this certification when shopping iPhone or iPad accessories. 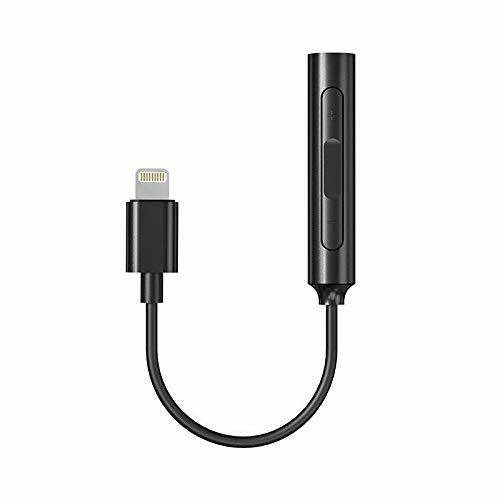 The FiiO i1 DAC/ 3.5 Lightning Headphone Adapter features a DAC, otherwise known as a digital-to-analog converter. This ensures that the audio quality produced will always be crystal clear, with no risk of distortion. It also supports lossless audio all the way up to 48kHz, while also supporting a number of different lossless audio file formats. This particular adapter also takes high-quality audio even further, with the addition of a built-in high sensitivity microphone. Most built-in microphones are of exceptionally poor quality, producing voices that sound highly distorted. Luckily, this particular microphone is different, and it even supports high definition voice calls. This means that you can have a crystal-clear conversation no matter where you are. A lot of adapters that are similar to this one have been built specifically for the iPhone 7 and future new models, because of Apple’s decision to completely remove their old headphone jack. This particular product is rather different. It is also compatible with a range of older devices, including iPhones all the way back to the iPhone 5. This adapter is also compatible with a range of different iPads, starting with the standard iPad and the iPad Mini. It can also be used with both the 5th and 6th generations of iPod Touch, and the iPod Nano 7th Generation. One of the best things about the FiiO i1 DAC/ 3.5 Lightning Headphone Adapter is that it actually has a dedicated iOS app. This means that you no longer must upgrade your product when a newer and better model is released. Instead, you can simply download firmware upgrades via the simple and easy to use application. The application is available for a number of Apple devices. The application doesn’t need to be installed to use the adapter, but it is a good feature. This particular adapter also has a system of controls in the form of a built-in 3 button remote, enabling a range of smart controls. These controls are even functional when the earphones lack the controls to begin with. They also enable the adapter to be compatible with a wide range of music applications and formats. Durability is something that should always be taken into consideration when choosing any form of attachment for an Apple device, as some products simply do not last. This is especially common with devices that have not been Apple MFi Certified, unlike this adapter. There is an 80cm cable connecting the part that goes into your Apple device to the part that your earphones plug into, meaning that the cable is unlikely to be pulled. This sort of pulling and tugging motion often results in damaged wires. There is even an integrated cable winder, which ensures that all of the cables are kept completely in order without an issue. In our opinion, the FiiO i1 DAC/ 3.5 to Lightning Cable Adapter is a fantastic product, enabling you to keep using your favorite earphones with even the newest Apple devices. It greatly enhances the user experience and has been built to be slim enough to fit within the majority of different phone cases. It should be noted that certain cases might not have a gap wide enough for the adapter. You do not have to worry about having to install the iOS application to use the adapter straight away, you simply have to plug it into your Apple device. It would be advisable to download the application if you want to keep up to date with a wide range of different firmware updates. This particular model also doesn’t draw too much power directly from your device, putting itself into a low power mode whenever you are not using it to conserve power. When it comes to choosing a great adapter, you really do need to know what sort of adaptor you are looking for. Most people would go out of their way to look for a device that promises them excellent audio, without having to worry about sacrificing quality for specific features. Most people would also want an attachment that is safe. This particular device fits both of those ideals perfectly, with the DAC promising perfect audio and the Apple MFi Certification promising that the device will not break your phone. It even looks as though it has been pulled right out of an Apple office, with a design that fits in seamlessly with the average iPhone, iPod, or other Apple product. It is safe to say that anyone looking to continue using their favorite pair of headphones with a newer iPhone would benefit from owning the FiiO i1 DAC/ 3.5 to Lightning Cable Adapter. It appears FiiO has released a version that is only 7cm long – still longer than the Apple dongle, but much shorter than the ridiculously long 80cm version referenced above. Any chance on getting a review of the shorter version, just to make sure it works properly?